Umasi La (5350 meters) connects Kishtawar Region of Kashmir with Zanskar. We follow a defined trail through oak and conifer forests and pass beautiful villages. 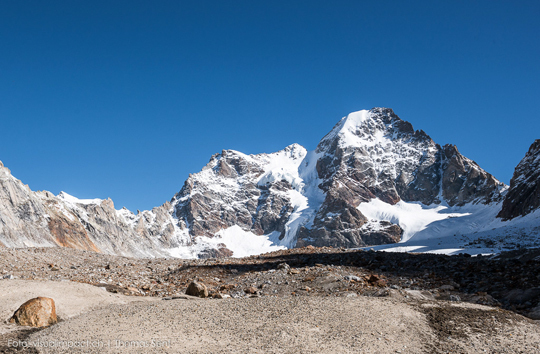 We get to cross below the Kishtwar Shivling Peak (6000 meters) and climb boulders, rocks, moraine and camp on a glacier. The pass is situated in a tiny corridor of giant rock walls. A fairly demanding trek, we will need crampons, ropes and ice axe on occasions. Umasi La is not attempted by many trekkers and is opened for a limited period in Summers. Although it offers amazing views of Pir-Panjal Mountains Ranges in Himachal Pradesh. It's best to conduct the Umasi La trek from end of July till end of September. Umasi La offers a great way to discover the hidden and untouched beauty of the snow capped Himalayan Mountain Peaks. Before starting our trek we will spend some time in Zanskar Valley, and visiting some impressive monasteries of Tongde, Zangla and Karsha. There are many restaurants and hotels in Padam. But you need to watch out for your belongings as there are cases of theft in this region. From Padam we drive towards Sani. 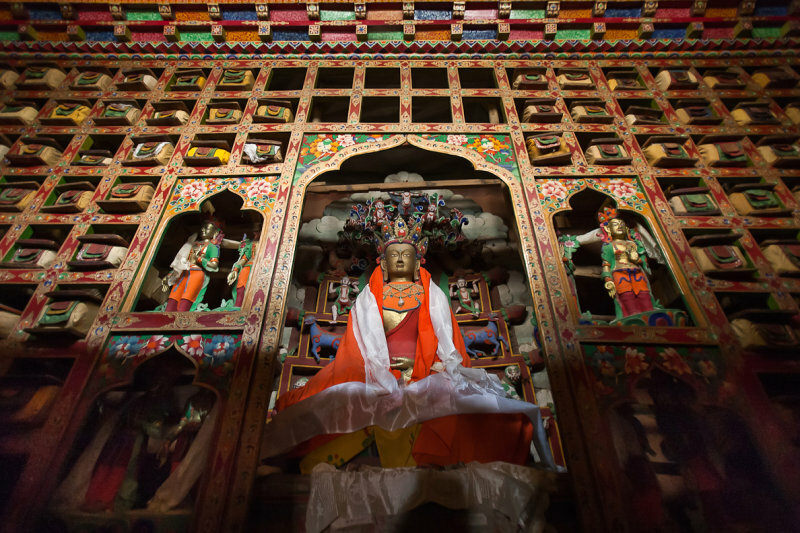 Its the oldest monastery in Zanskar. It was supposedly build by Emperor Kanishka in 2nd Century. There is a cave where sage Padamsambhava meditated for several year and is still used as a meditation cell. The monastery is also claimed to be connected with the famous Indian Yogi Naropa. There is now small room next to the Kanika chorten where it is thought that Naropa meditated in which there is a veiled bronze statue of the yogi. We stay here at a guest house tonight. Apart from the Kanika stupa, the main building consisting of a large multi-columned central prayer hall, is also an attraction of Sani Monastery. The prayer hall displays a number of different types of statues of popular Buddhists divinities and 'Drugpa' (Old Schools) saints. The walls of the hall, constructed in the 17th century, are adorned with frescoes and thankas. Today will be comfortable trek for 4 hours towards Ating village. We trek for a few kilometers following the dirt road to Ating Village. We camp here tonight. We head towards the dirt road, overtake the bridge without crossing it and reach Zongkul Tompo. Zongkul is a cave monastery perched on the rock face of Ating George. It is said to be connected with Naropa, the famous Indian Yogi. Naropa used to meditate here. Inside the caves there are markings said to be Naropa's footprints. 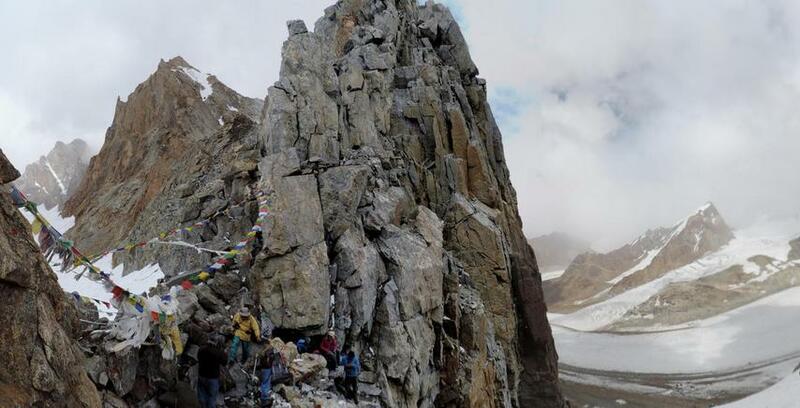 It's considered as the sacred place of meditation for all most enlightened people of Zanskar. There are precious artifacts, an ivory idol, a crystal Stupa and spiritual texts and scriptures of great sages of Zanskar. There are beautiful murals over 300 years old inside the monastery. After a visit to the monastery we will ascend the slopes coming on moraine and scree and glaciars to reach our campsite located on a grassy meadow at the base of the pass. We camp here tonight after dinner and retire for the long journey ahead. Today we will start very early after breakfast as ascent to Umasi La is demanding. We rope in, wear our crampons and Ice Axes to start our glacial walk on the top of Umasi La. It's a broad glacier and we carefully ascend negotiating the crevasses until we reach a narrow gully which leads us to the pass. The pass itself is a small gap in the cliff amid high mountains. The pass is marked by cairn and flags. Their are beautiful panaromic views from the top of the pass. The descent is steady but tricky as we cross over glaciar and then snow fields over an overhanging rock cliff. We will be camping here tonight surrounded by ice and snow amid stars. It will get cold at night as the campsite is at 4900 meters. We start early today in the cold due to the altitude and descend over glacier throughout our trek for a long distance and climbing over boulders till we reach a terminal moraine and cross over to the rocky base. 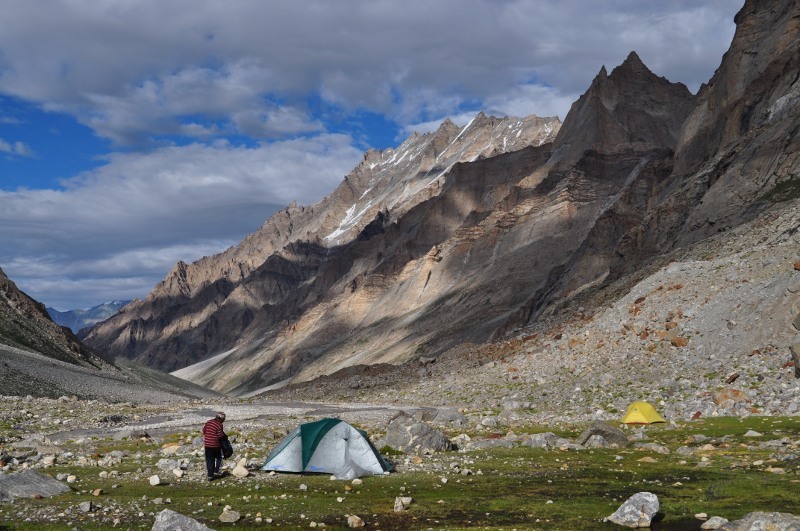 We can either camp here if late or proceed for a steep descend towards a beautiful alpine valley at the foot of Kishtwar Shivling Peak (6000 meters) surrounded by wonderful fields of edelweiss. Today will be an easy day as we camp at the grassy meadows of Suncham and share company with shepherds and their huge flocks of sheeps and goats. Suncham is also famous for its mines of precious stones. We can either rest here or proceed a little ahead towards the village of Marchel and appreciate its Buddhist culture and close ties with Zanskar. Today will be a long day as we will be crossing a number of villages, while enjoying beautiful views of the Pir-Panjal Mountain Ranges through Oak and Conifer forests towards the village of Gulabgarh. Which is situated over the confluence of Pardar and Chenab Rivers. It has a small market and people here are of Ladakhi Origins. We can stay here in the guest house tonight for our next day journey back to Manali via Keylong and Udaipur in two days.